The Environmental Policy Alliance is a front group operated by the PR firm Berman & Co. The firm operates a network of dozens of front groups, attack-dog web sites, and alleged think tanks that work to counteract minimum wage campaigns, keep wages low for restaurant workers, and to block legislation on food safety, secondhand cigarette smoke, drunk driving, and more. The Environmental Policy Alliance describes itself as "devoted to uncovering the funding and hidden agendas behind environmental activist groups and exploring the intersection between activists and government agencies." It is a project of the Center for Organizational Research and Education (CORE) and consists of several sub-front groups, including Big Green Radicals, EPA Facts, Green Decoys, and LEED Exposed. According to the watchdog organization Citizens for Responsibility and Ethics in Washington (CREW), the Environmental Policy Alliance "attacks environmental advocacy groups and fights against environmental regulation by the government." The organization shares a mailing address with notorious lobbyist and front-group operator Richard Berman and his firm. Research analyst Anastasia Swearingen, who has published materials on behalf of the Environmental Policy Alliance and its projects, has previously worked for other Berman-associated organizations Center for Consumer Freedom and the American Beverage Institute and is a Berman & Co. employee. Richard Berman and his front group the Environmental Policy Alliance released a video entitled "Breaking Up With Fossil Fuels is Hard to Do" on February 10, 2015 on the website of Big Green Radicals, another Berman front group. The video is an attack on Bill McKibben and 350.org's movement to divest from fossil fuels. The Center for Media and Democracy's PRWatch noted, "Although it is not known who specifically bankrolled the video, it was being promoted online by Independent Petroleum Association of America, the Institute for Energy Research, the American Energy Alliance, and the American Fuel and Petrochemical Manufacturers, ad groups and trade associations representing fossil fuel interests. "What would you call a radical organization that threatens to shut down 25 percent of our electric grid?" It lists "anarchist," "militia," and "terrorist" -- all struck out -- and leaves "Obama’s EPA." "Obama's Environmental Protection Agency has issued regulations that threaten to shut down about 25 percent of the energy that powers America's electric grid. With radicals like this in power, who needs enemies?" In May 2014, Big Green Radicals launched a PR campaign against various Colorado groups seeking to block fracking in the state, calling it "ground zero" in the fracking debate. BGR sought to define the groups -- including the Colorado branches of Food & Water Watch, Water Defense, and Sierra Club, as well as Americans Against Fracking and Artists Against Fracking -- as astroturf organizations, groups that claim to be grassroots but are really primarily created by special interests. Big Green Radicals further asserted that these "extreme groups, mostly based far from Colorado in San Francisco, New York, or Washington D.C., are spending millions and spreading their anti-science message to scare voters into approving ballot measures in November to send the oil and gas industry (and the jobs and affordable energy it provides) packing from the Centennial State." In addition to its attack on these anti-fracking groups, BGR rebuked Colorado Congressman Jared Polis as the "poster boy" for the anti-fracking movement. At a June 2014 Western Energy Alliance event including representatives from Anadarko Petroleum, Halliburton Company, ExxonMobil, Devon Energy, and Noble Energy, Berman himself told the gathered fracking executives they "must be willing to exploit emotions like fear, greed and anger and turn them against the environmental groups" opposed to fracking, according to the New York Times, which obtained leaked audio of the speech. "And major corporations secretly financing such a campaign should not worry about offending the general public because 'you can either win ugly or lose pretty,' he said." "Think of this as an endless war," Berman told the group. "And you have to budget for it." Berman "offered companies a way to anonymously target their environmental foes -- at a cost of as much as $3 million" just to fight Colorado's proposed fracking bans according to Bloomberg, which also obtained the audio. And that $2 to $3 million "would be spent in addition to the 'positive campaign' companies were running," he said. According to Bloomberg, Berman "played an advertisement that showed one activist blaming fracking for his overeating and another for the fact that his sock-puppet, Mr. Snuggles, was ignoring him. The ad was posted online and ran on television a few weeks later, according to a Denver Post article." "What people always want to do is they want to know who funds me so they can attack the funder," Berman told the Western Energy Alliance. "We run all of this stuff through nonprofit organizations that are insulated from having to disclose donors." ↑ Environmental Policy Alliance, "Home Page," group website, accessed February 20, 2014. ↑ Citizens for Responsibility and Ethics in Washington, Berman Exposed.org, organizational project website, accessed June 12, 2014. ↑ Anastasia Swearingen, Mis-LEED-ing green buildings, USA Today, March 12, 2014. ↑ Big Green Radicals, Divest From Fossil Fuels? Not if You Like Your Life, group website, February 10, 2015. ↑ Mary Bottari, Richard Berman Goes after Bill McKibben and Global Divestment Day, PRWatch, February 12, 2015. ↑ Environmental Policy Alliance, Full-page Ad Highlights EPA Threat, EPA Facts website, June 2, 2014. ↑ 7.0 7.1 7.2 Environmental Policy Alliance, Big Green Radicals Colorado page, BigGreenRadicals.com, accessed June 12, 2014. ↑ 8.0 8.1 8.2 Eric Lipton, Hard-Nosed Advice From Veteran Lobbyist: ‘Win Ugly or Lose Pretty’, New York Times, October 30, 2014. ↑ 9.0 9.1 9.2 9.3 Mark Drajem, Fracking Advocates Urged to Win Ugly by Discrediting Foes, Bloomberg, October 30, 2014. 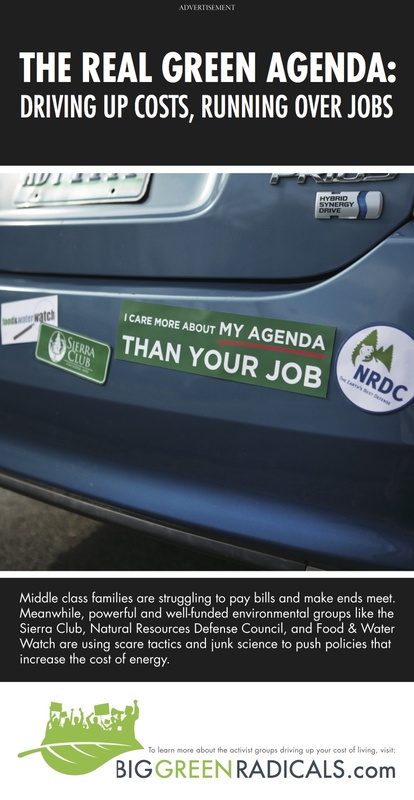 ↑ Big Green Radicals, Big Green Radicals ad, Wall Street Journal, March 6, 2014.